I ran into this issue with a customer today. She wanted their SharePoint site, part of their Office 365 subscription, as her home page in Internet Explorer 11. I put their SharePoint URL as the homepage in Internet Explorer. As soon as I opened Internet Explorer 11, it would instantly crash. After trying to open Internet Explorer up multiple times, and each time it crashed, I knew it was something between Internet Explorer and SharePoint Online not playing nice. I went to EventViewer and found this message. The item that stood out to me was the faulting module name: ucrtbase.dll. 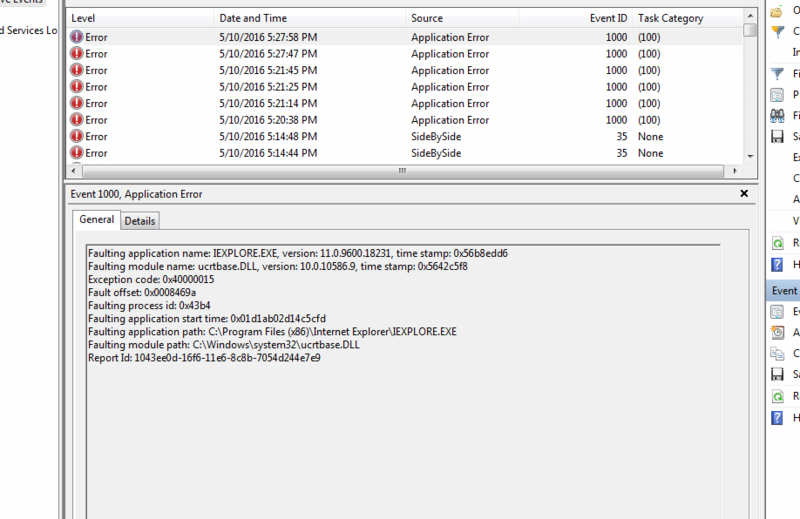 I did some research online and found the SharePoint Export Database Launcher addon was causing the crash. According to this site; the SharePint Export Database Launcher does the following tasks. When a page that contains a view of a list opens, the _ExportToDatabase function is called, which is defined in the OWS.js file. This function creates the control on the page and exports the list. This control is defined in OWSSUPP.dll, a dynamic-link library (DLL) that is installed in the %ProgramFiles%\Microsoft Office\Office14\ directory on the client computer during Microsoft Office 2010 Setup. This entry was posted in Troubleshooting and tagged Add-On, Internet Explorer, Internet Explorer 11, SharePoint on May 10, 2016 by Merlin Halteman. Here is a compatibility issue I ran into a couple times. When a someone tries to access their remote web access portal, they get an error. After putting in their credentials the remote web access portal will begin to load then all of a sudden they will get the following error. Server Error 404 – File or directory not found. The resource you are looking for might have been removed, had its name changed, or is temporarily unavailable. Sometimes this error indicates something more serious, but recently I have found that you will get this error because of an Internet Explorer 11 and remote web access incompatibility. The first thing to do is check which version of Internet Explorer you are using. Go to the Gear icon and click about Internet Explorer. Check if you are running Internet Explorer 10 or 11. If you are , add your remote web access URL into the compatibility mode list. and select the Compatibility View Settings options. Add your website to the Compatibility View list and hit Close. Refresh your tab and see if that makes a difference, it did for me. This entry was posted in Troubleshooting and tagged Internet Explorer 11, Remote Web Access on March 1, 2014 by Merlin Halteman.